Those of you that have already pre-ordered your new Apple Watch and are counting down the days for its delivery later this week on April 24th. 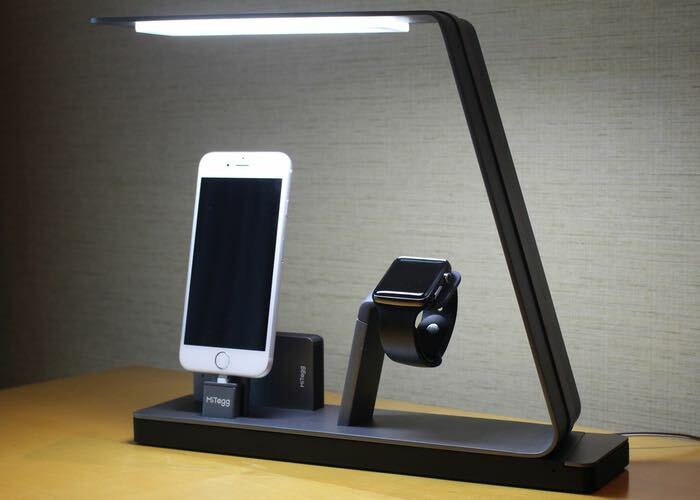 Maybe interested in a new iPhone and Apple Watch dock called the NuDock which combines a number of useful features such as a portable backup battery as well as a useful desk light. The NuDock as it has been called is currently raising crowdfunding over on Indiegogo and has already tempted over 2400 backers to part with over $300,000 in funding. Making the project over 1000 percent funded already with still 15 days still left to run. The smart LED light is equipped with touch sensitive controls that allow user stop adjust the brightness of the LED easily and effectively when required. – Our touch sensitive control allows you to adjust the brightness of the LED light as well as offering automatic 1 Hour Sleep Mode. – Fully adjustable, charge your iPhone without the hassle of removing your protected case or Mophie Juice Pack battery case. For more information on the new NuDock Apple Watch dock and to get your very own jump over to the Indiegogo website for details via the link below and make a pledge from $149.